The Linton Law Firm is considered one of the leading personal injury and medical malpractice law firms in the greater Cleveland, Ohio area with a proven record of helping people turn their lives around after a severe injury or death. We have obtained some of the highest reported settlements and verdicts in the state and our county for our clients. If you have been harmed by negligence or abuse, our Firm can provide compassionate, creative and aggressive representation to address your need for appropriate compensation as well as your physical and emotional healing. We can help you and your family move forward, even after the most devastating of injuries. Contact us today to schedule a free consultation. From our office in Cuyahoga County, we serve clients in Northeast Ohio and throughout the state, and can make arrangements for representation in other states, as well. We are available to meet in your home, hospital or your office, whichever you prefer. From the moment we take your case, you can be assured that your welfare and best interests are foremost in our minds. Led by veteran attorney, Robert Linton, our firm is recognized for professionalism throughout the legal community. 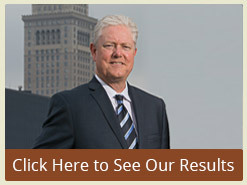 We hold the highest ratings available from our peers, other lawyers and judges - including the prestigious Martindale-Hubbell AV rating for our legal abilities and ethics-and Ohio Super Lawyers, a listing limited to the top 5% of the lawyers in the state. We only accept cases that we truly believe are meritorious and where we believe we can make a significant difference in our client's lives. We focus on quality, not quantity so we can provide our clients with the attention they deserve. We have access to nationally recognized experts assist in building strong cases in the complex malpractice, catastrophic injury and wrongful death litigation we handle. We have a reputation for handling severe injury cases, wrongful death, serious motorcycle, truck and auto crashes and medical malpractice claims. Judges, insurance adjusters and opponents know our reputations and appreciate the energy and resources we invest in each case. Even though most cases settle before trial, we prepare our cases to be trial ready. This dedication at the front end has lead to a record of successful outcomes for our clients. Better preparation means better results. At your free initial medical malpractice consultation, we will review the facts of your case to determine if you have a malpractice claim worth pursuing. If you don't, we can help bring healing and closure. And if there is a case, we fight for our clients for the justice they deserve. Because it's not only about them - but also about changing the system - so it doesn't happen again to someone else. We accept most of our cases based on a contingency basis based on a percentage of what we recover. That means you pay us only if we win. If we don't, you owe us nothing. This is the only way most people can afford to take legal action against well financed hospitals, corporations and insurance companies. Contact us at our Cleveland, Ohio, office for a free consultation with an experienced wrongful death, severe injury and medical malpractice lawyer. Hospital or home appointments available • Free consultation • Conveniently located in the warehouse district near the state and federal courthouses in Downtown Cleveland.